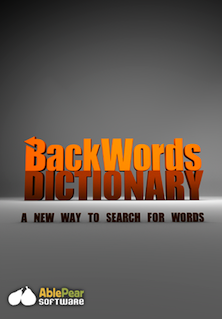 Now available in the App Store, BackWords Dictionary is a new way to search for words. Pick letters with just a flick of your finger and BackWords quickly finds matching words. BackWords is a fun alternative to looking up words in a traditional dictionary, thesaurus or even on the web. BackWords is powered by the Enhanced North American Benchmark Lexicon (ENABLE), the authoritative word list and common alternative to the Official Scrabble Players Dictionary that is used in many popular word games, including Words With Friends. BackWords contains over 173,000 words, with a few objectionable terms removed so it's suitable for word game players of all ages. BackWords is a great helper when playing word games like Scrabble, Words With Friends or Boggle or solving tough crossword puzzles.